Students and faculty at Grayson County High School and Technology Center are joining others across the nation during February to celebrate national Career and Technical Education (CTE) Month. 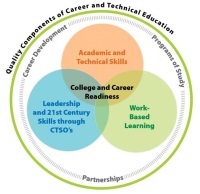 CTE encompasses many different types of education, from classroom learning to certification programs to work-based learning opportunities outside the classroom, and directly prepares students for high-wage, high-demand careers. The CTE programs at the Grayson County Technology Center are Automotive, Carpentry, Computerized Manufacturing and Machining, Health Sciences, Marketing, and Welding. The CTE programs at the High School are Agriculture, Business, and Family and Consumer Science. This year the Technology Center has initiated a work-based learning program, partnering with local businesses to offer job shadowing opportunities. These unpaid work experiences allow students to learn in a real-world, workplace setting. Community involvement and support is vital to the CTE journey for both students and potential employers. In addition to the work-based program, business partners provide on-site learning through events such as Manufacturing Week, held each September, tours and presentations throughout the year. Community and business leaders frequently visit the Technology Center for a first-hand look at the training provided their future workforce. They also serve on advisory committees, sharing insights to improve the programs, and the CTE learning experience and environment. Students can further develop team and leadership skills through participation in a number of Career and Technical Student Organizations (CTSOs). These student-led, community service groups in Grayson County Schools include DECA, FCCLA, FFA, HOSA, and Skills USA. Cross-district events such as Unite to Read and GCMS Transition Day provide opportunities to build awareness of CTE programs with students at all levels, giving them a taste of each before they enter high school and prepare for their own pathway journey. The school has worked closely with ECTC to provide five CTE dual credit opportunities. In addition to this rigorous coursework, students can also demonstrate their technical ability and preparation for the workforce through industry certifications and participation in the WorkKeys Assessment. WorkKeys scores help students compare their skills to the skills real jobs require, with test questions based on real world work situations. They also help employers choose the most qualified candidates for their job openings. These tools let them know that students have the essential skills necessary to be successful at their companies. A strong academic foundation, coupled with real-world training and community partnerships all work together to provide CTE students with the latest technology and skills to prepare them for success as employees, as well as future leaders. 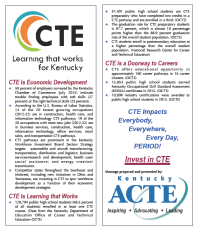 For more information about career and technical education programs provided at the Grayson County Technology Center, contact Matt Hayes at (270) 259-3195. As students have been immersed this year in hands-on, work-based learning initiatives, school and community projects have provided an additional opportunity to further build on the skills they learn in the classroom. The Carpentry program is working with local manufacturer OFS to build tables, chairs and other office furniture. Automotive is partnering with the Leitchfield Police department to provide automotive services while building relationships with students. Welding is building prefabricated metal buildings and other decorative items. Machining is revamping the program to provide traditional manual machining and an engineering curriculum for students interested in programming pathways. The Health Science program has added a dual credit medical terminology class and provides staffing for local long-term care facilities as well as multiple certificates for health care jobs. The Business department has doubled the number of dual credit opportunities for students and continues to offer a Microsoft Office Certificate. Agriculture continues to provide community service for Wings on a Prayer and uses the greenhouse to deliver plants for the community. Marketing has moved to the high-demand pathway of e-commerce, which will allow students more opportunities to take both business and marketing classes. Family and Consumer Science is expanding the catering and culinary program to add lunch deliveries and provide students with the opportunity to plan menus, sell lunches and learn food service principles. CTE - Did you know . . . ?